At Santa Caterina we have always prepared canned tomatoes for the winter, from peeled tomatoes to marinara sauce. Until a few years ago I was not doing these preparations, there was always someone else to do them, my mother or a neighbor. They spent time together, peeling tomatoes on sunny summer afternoons telling stories of the past and updates on the events in the country. 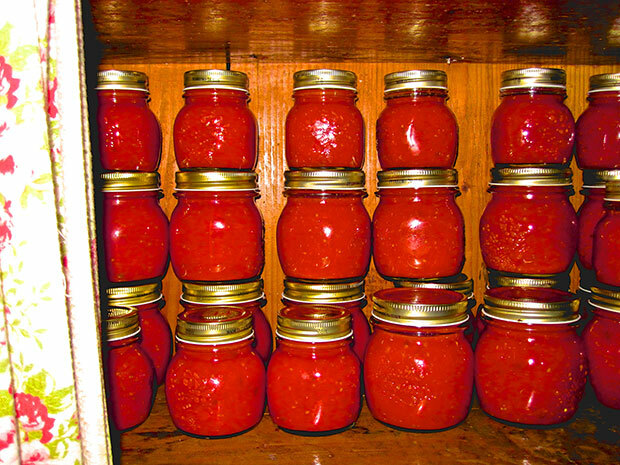 This year, thanks to an abundant production of tomatoes I’ve already filled a forty jars. The recipe given here is made with a mixture of tomatoes, cooked in their skins and passed through a food mill. The quantities are approximate because everyone can try their hand even with a small amount of tomatoes and the extra flavors should be added in proportion to the amount of tomatoes you use. 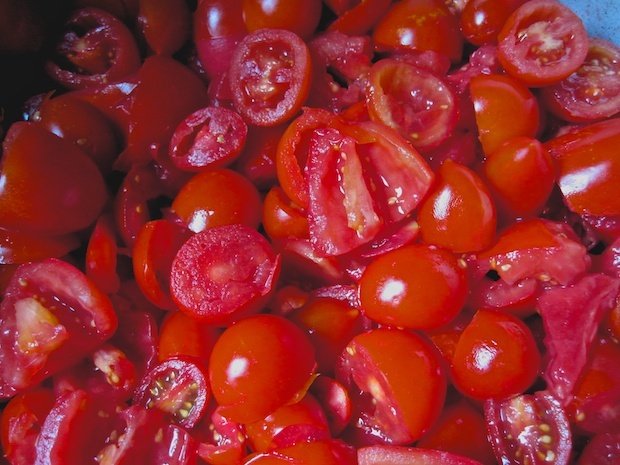 Wash the tomatoes and remove any external parts yellow or green. Cut them in half. Place them in a pan with high sides and a thick bottom. Add all ingredients, making sure to tie the herbs with kitchen twine. Bring to a boil, lower the heat and cook down slowly for about two hours. Stir occasionally with a wooden spoon. 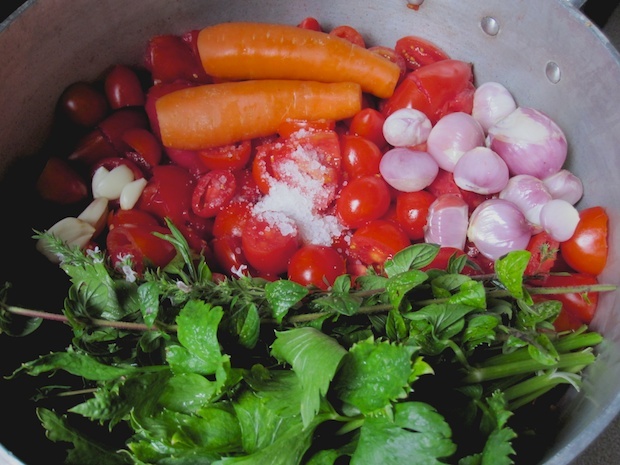 When the vegetation water has reduced, pass the cherry tomatoes, vegetables, carrots, garlic, shallots through a food mill and into a large bowl. The herbs out because I like the sauce to be red once its passed through the food mill, but if you love the flavors may very well be passed along with the cherry tomatoes. Put in jars with cap suitable for canning, follow the instructions in the cap. Let them settle in a pot with cold water that covers the jars and by the time it reaches the boiling account 15 minutes. Then take them out, I tip them and let them cool before storing. Posted in Recipes, Vegetables. RSS 2.0 feed.